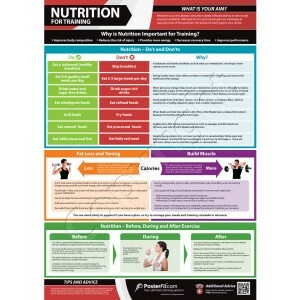 840mm x 594mm, this framed A1 full colour, highly illustrated poster is enclosed in a robust heavy-stock encapsulation, and includes key definitions, and illustrated points on nutrition do and dont's, fat loss and toning, muscle building and nutrition before,dring and after exercise makes this a highly recommended wall chart. A unique feature is a QR code that gives free instant access to further nutritional advice. Recommended for gym suites and GCSE/AS/A2/BTEC Sport courses supporting PPP. In a framed format - provides non-glare, non-yellowing finish mounted within a curved, silver 25mm aluminium edge.